Diwali is a festival to be grateful to God for showering his blessings upon us and to express love and care for our dear ones. It is a common tradition to visit the places of worship on this day. People also visit and meet their relatives and friends on the day of Diwali. As Diwali is a five day festival it is often seen that these get together spread across these five days. Ladies engage themselves in preparing various kinds of sweets, snacks and other recipes. Sweets like Besan-ka-ladoo, Gajar-ka-halwa, Gulab-jamun are very popular. Along with sweets there are some popular snacks that are very easy to prepare and look good to serve on the festival of Diwali. Mentioned below are some popular sweets and snacks’ recipes. Sugar syrup should be made earlier. Mix 2 cups Sugar in 1 cup of Water. Add 4-5 Cardamom pods, finely crushed and few strands of Kesar (Saffron). Mix it well and heat on a low flame, till the Sugar dissolves. Keep this syrup warm, until Gulab Jamun balls are fried. This syrup will be used to add sweet taste to the Fried Jamuns. Make the dough by adding Milk-powder, self-raising floor, cream and mix them well. Convert this dough into small balls, using oil in both hands. Take a pan and put oil for frying. In hot oil, fry these balls, until brown in color. Finally, put these fried balls of Gulab-Jamun into Sugar-Syrup. Take ghee in a pan and fry gram floor till brown in color. While frying, keep on stirring to avoid lumps. Remove it from heat and allow Besan to cool. Add sugar, nuts to the mixture. Finally convert them into fairly shaped balls. Mix the above ingredients using little water and convert it into fine and soft dough. Roll out the dough into thick chapatti. Cut the chapatti into diamond shaped pieces of equal size. Dry these pieces on a cloth. Deep fry these pieces in hot ghee. Once deep fried, allow them to cool. Also known as Namak Pare, Gathiya is a very popular recipe for the festival of Diwali as it provides a good break from the traditional sweets and looks good to serve. 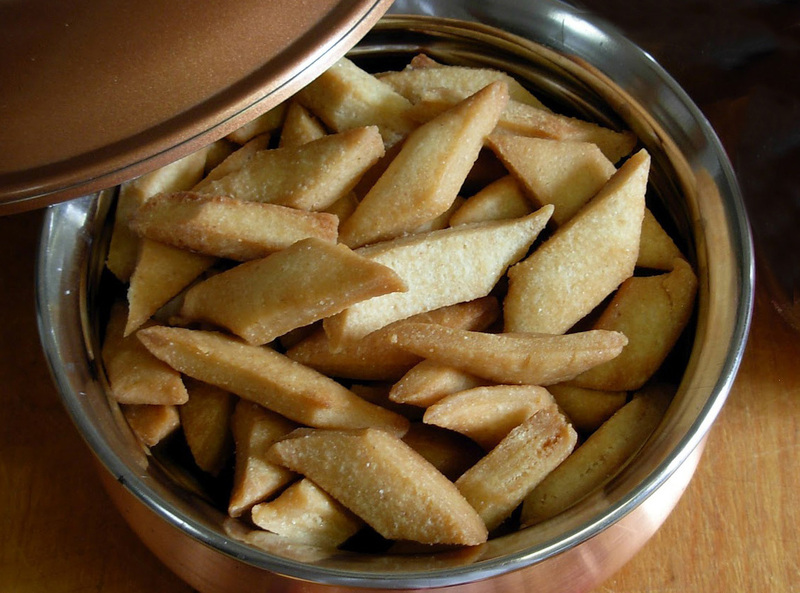 Gathiya is a salty snack, that can be made of white flour or Maida. Sieve the wheat flour and rub oil to it. Then to the sieved flour, add Ajwain (Carom seeds) and mix well. Convert the flour into relatively hard dough. Roll out the dough into thick chapattis and cut them into slices. Fry these slices in the hot oil. Remove them from oil when golden brown in Color. Soak the Dal overnight and clean it. Grind it into a thick paste. Add Salt to one’s taste. Make them in shapes of vadas and fry them. Serve Vada after squeezing water from it.